For my artifact, I decided to check out a few folders from the Peter Dougherty Papers of the Downtown Collection. I viewed folders 24 through 26. I wanted to get a look at some flyers and other promotional materials from the club scene in the late 70s and early 80s. 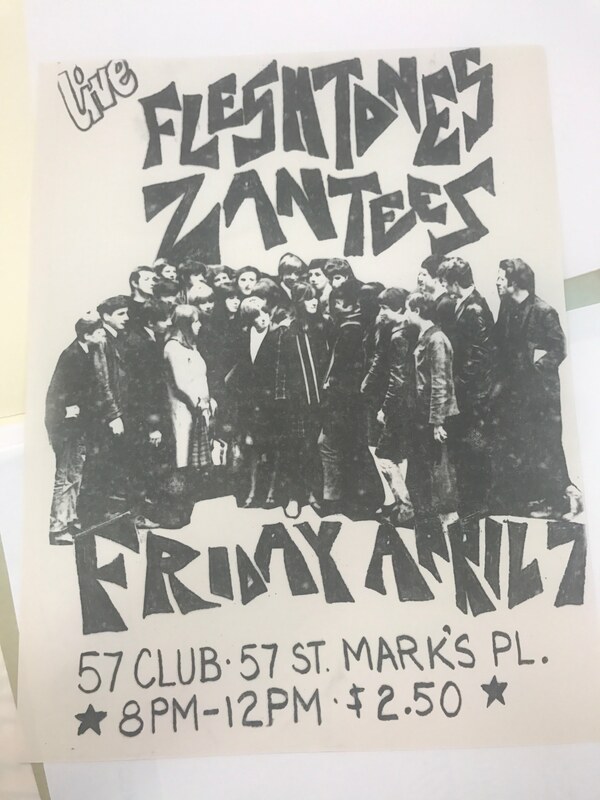 While I viewed material from CBGB and some Clash materials as well, I landed on focusing on Club 57 and the materials regarding it in folder 26. While I’ll talk about other things related to Club 57, I’ll narrow the “artifact” down to one piece from the collection, which I chose to be the club’s event calendar from September 1980. Club 57 was renowned for its cultivation of artists and eccentric folks from around the downtown culture. Like a lot of what was going on in that scene in the East Village in the 70s and 80s, the general style is edgy and gritty. 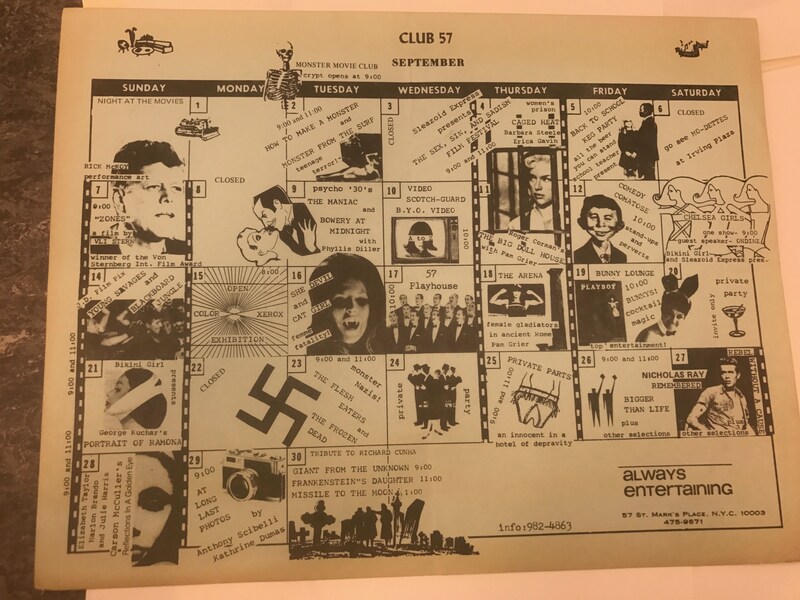 I felt that the calendar was a good choice for an artifact to represent Club 57 because it displays how diverse some of the content and events passing through the club during this period were. Just from this month alone, one can see everything from kitschy horror films, to arthouse, to punk acts, to so on and so forth. Interestingly enough, the New York Times, in a recent article, stated that Club 57 “hardly looked like hallowed cultural ground, let alone the heart of the 1980s East Village art scene”. Obviously in retrospect, this is a fascinating observation. The article goes on to refer to the club as a home of sorts for Jean-Michel Basquiat, Keith Herring, and that ilk. Likely part of the charm and allure of the place is its unassuming nature. After all, the club was located in the basement of a Polish Church, how more obscure could you get? Recently, the MoMA did a full exhibition on Club 57, which provides a lot to the mythology and the history of the famed establishment. For some context, the club was open only briefly from 1978 to 1983, located at 57 St. Mark’s Place, hence the name. The MoMa refers to it in high regards, claiming that it was “[a] center of creative activity in the East Village, Club 57 is said to have influenced virtually every club that came in its wake”. Like much of New York’s history when it comes to the arts, and really anything at all, the conceptual fantasy of any given place, which tends to seem oh-so-unattainable in present times and larger than life, surely applies to the image and regard of Club 57. To my point about the diversity of acts, events, and entertainment that is clearly apparent when looking at the calendar, the club was also famous for its inclusion of a wide array of patrons. Club 57 appealed to broad range of New Yorkers and had no qualms about its inclusivity. i-D Vice remarks that “[t]he founders and patrons of Club 57 blurred the lines between gay and straight, highbrow and lowbrow, art and partying in daring and unprecedented ways”. For the 70s/80s, it was both a time where being progressive was cool but certainly not as easy and as accepted as it would be in the same area today. Obviously there was far more resistance back then and inclusivity was an active and political choice rather than more so of a given as it might seem nowadays. Going off that point, while I was scouring the Peter Dougherty Papers, I came along another interesting piece from Club 57. In the same folder that the calendar for the club was in, there was also a flyer advertisement for an “International Rap Night” for June of 1981. I think that’s really another hearty facet of how inclusive and expansive this club was. Rap and Hip-Hop were burgeoning scenes at the time and, while in retrospect have a lot in common with the punk/alternative underground, it wasn’t necessarily a common thing to include rap in downtown Manhattan. It reminds me, in junction with the fact that there was a DNA flyer in the Dougherty collection as well, of the scene where Fab Five Freddy is hanging out in the Village area in Downtown ’81. 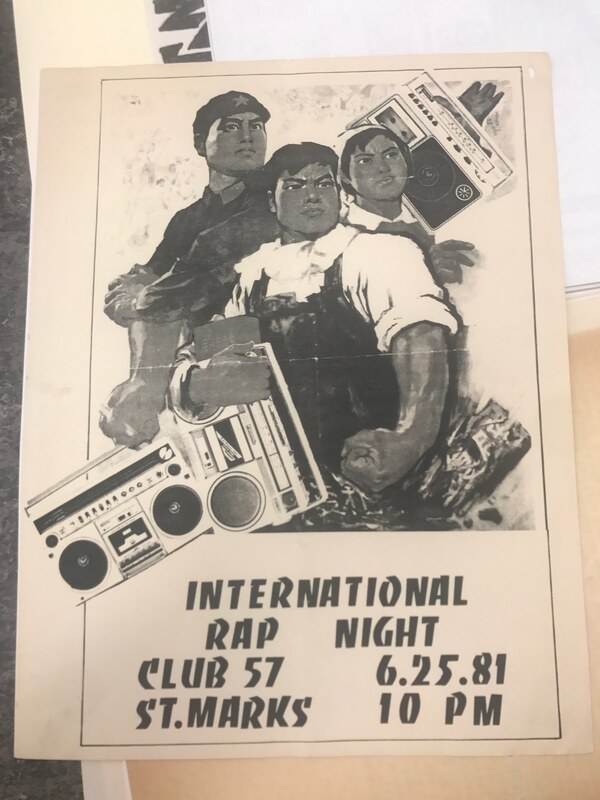 Given that Basquiat was also a staple of Club 57, it all seems to make sense to have them together, Nonetheless, the flyer for the “International Rap Night” was a interesting site in the folder that was otherwise full of punk act flyers and arthouse films. It’s also interesting to analyze the space and condition of the area that Club 57 existed in at the time. Ron Magliozzi, one of the curators of the club’s MoMA exhibit, claimed that “[t]he East Village looked like London after the blitz — empty lots, burning buildings, and a mix of a lot of Eastern European and Puerto Rican immigrants. It was a very scary place to go to. It kind of replaced Harlem as a place you were afraid to go to”. That assessment, on top of the fact that many of the other testimonials talk about the impromptu nature in which the building’s owner offered to have people start a club in his basement, gives the image of every staple of DIY punk-style lower Manhattan start-ups at the time. “Club 57: Film, Performance, and Art in the East Village, 1978–1983 | MoMA.” The Museum of Modern Art, www.moma.org/calendar/exhibitions/3824. “Club 57.” Wikipedia, Wikimedia Foundation, 12 Mar. 2018, en.wikipedia.org/wiki/Club_57. Sokol, Brett. “Club 57, Late-Night Home of Basquiat and Haring, Gets a Museum-Worthy Revival.” The New York Times, The New York Times, 26 Oct. 2017, www.nytimes.com/2017/10/26/arts/design/club-57-museum-of-modern-art.html. Wheeler, André-Naquian. “An Oral History of Club 57, the Legendary 80s Underground Art Club.” I-d, 2 Nov. 2017, i-d.vice.com/en_us/article/evbbgw/an-oral-history-of-club-57-new-yorks-legendary-underground-art-club.